In my last post I mentioned that I'd recommended a drum kit. It wasn't until I actually went to link to the recommendation that I realized I had NOT actually posted that recommendation here... rather it was on the TMA website forums. So let me rectify that right now. This is mostly what I posted there, but updated, corrected, and edited. I've never played drums before, or included any rhythm much past a hand clap, or click track on a recording. For Song Fu I thought it may come in handy to have some drums, so I first tried to find a drummer, and failing that I picked up a Spectrum AIL 602 electronic drum kit. This isn't a sequencer, it's a set of drum pad that output audio to an amplifier. I figured I'd put it into my 4-channel mixer learn to play a few rhythms and all would be okay fine. As it turns out, all I used in our first song, Summer Rain, was the hi-hat cymbal. Not much experience gained. But our second song is the very first in which I've actually tried to play a full drum kit. (snare, 3 toms, kick, hi-hat, ride and crash cymbals). I used the snare alone on Angels and Demons. A drum kit is NOT something you beat on for rhythm. Well, it is, but that doesn't get very far. You have to treat the drums as instruments like anything else. And it ain't easy. You have to be a frakkin' octopus to play kick and hi-hat and everything else. That can be a foreign concept for those who play melodic instruments. I thought the pipe organ was tough. This is going to get me a "Well, DUH!" from experienced drummers, but I thought I'd just say that. AND apologize for any drummer jokes I may have laughed at in the past. 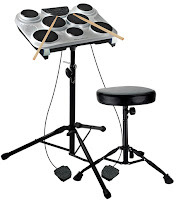 There are plenty of other electronic drumkits out there, and many of them more or less duplicate the placement and size of a real drum kit's drumheads. They also are pretty pricey. Spectrum make no attempt to do that with the 602. Nevertheless, it's surprisingly usable. The smaller pads mean that you have to be a bit more precise when you strike, but that's probably not a bad thing. The case is very durable plastic, and speakers are built-in. You can either mic the thing or use the line out jack. If you do mic it, that durable plastic case actually makes a pretty neat sound if you use it as an additional striking surface. Just sayin'. There are 215 voices, and you can assign any of them to any of the pads. So snare, cowbell, wood block... whatever... you can use it. It's like having a full percussion kit. There are 20 preset kits, and 10 more custom kits. Any of these is easily accessible using a wheel on the control panel at top-center. There is a USB output as well as the audio line out. As I mentioned, I inquired after replacement pedals. The reason is simple... unlike those pricey drumkits, which either use kick and hi-hat pedals that are engineered to resemble the real thing, or which actually use a real kick pedal against a drum pad, the AIL 60 ships with simple footswitches that are, quite frankly, completely and utterly worthless. Fortunately, the pedals, being simple, are easily replaced by a keyboard sustain pedals with phono plugs. Unfortunately these aren't velocity-sensitive, so you're going to get one sound only out of the kick, and you can't hold the hi-hat half-closed. Overall, the sound is similar to what you'd get from a quality MIDI loop. The samples themselves don't sound quite real, but you do get a live feel because they are in fact played live. Nevertheless, for the price these are pretty small quibbles. Now, I'm not a professional drummer, or even a good amateur, so my opinion should count for little. But as I see it, this is at the very least a fairly decent set of practice pads, small enough to fit in a single suitcase, stand and all. I bought this drumkit just to fool around with. and to have a set of drums to play when guys come over to my house to jam. I don't have much room so the small size to me is an asset. Keeping in mind, you get what you pay for, this is a very good drum set for the price at least for my purposes. Bull, Naked Boys Band. Most beginner drummers don't really need double braced stands with their drumset unless they hit "extremely" hard on a continual basis. Have this kit. Wondering if anyone knows how to use the record function to just record what you play without the prerecorded song playing along? Those first electronic digital products contain arm-damaging tricky plastic shields as well as generated synthesized bloops as well as bleeps of which seemed similar to the celeb Journey than something previously produced by a traditional acoustic drum.